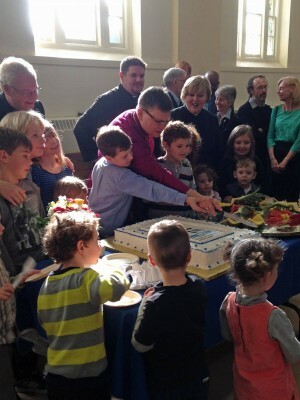 St. Martin’s celebrated the 125th Anniversary of its founding in 2015. Under the anniversary theme “We Were, We Are, We Will be a faithful Witness to God’s Love” many special events were held. The anniversary year began on November 30, 2015 with Bishop Michael Bedford-Jones as guest preacher at the 11:00 am service. At coffee hour, a book on the history of the parish, A Faithful Witness to God’s Love: The Church of St. Martin-in-the-Fields at 125 was launched. We were blessed with a visit from Archbishop Fred Hiltz, Primate of the Anglican Church in Canada who was with us for all services during Holy Week and Easter. Our Feast of Dedication on May 10th celebrated “Who We Were” with many parishioners dressed in costumes from the different decades of our history. Our Area Bishop Philip Poole celebrated and preached at this service. In addition, we dedicated two Anniversary memorials – a new set of green clergy vestments and a new stained glass window over the west entry door. 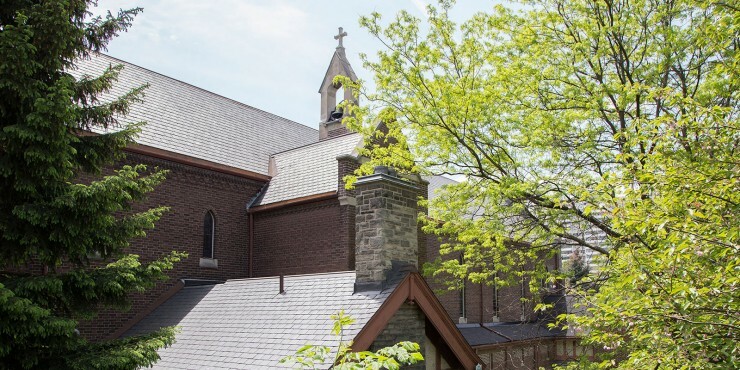 We welcomed the community to our Church and garden during “Doors Open Toronto” on May 23rd and 24th. Many neighbours joined us for a Community Fun Fair in the garden on June 20th celebrating “What we are” as well as with their pets, on October 4th for a Blessing of Pets. On Sunday, November 1st we dedicated another Anniversary memorial – a beautiful stained glass mosaic located over the fireplace in the Guild Room. On Patronal weekend November 14th and 15th we celebrated “What we will be” with a Gala Saturday evening of dinner, dancing and fellowship. We are grateful to Turner & Porter Funeral Homes for sponsoring a photo booth at the Gala. On Sunday Archbishop Colin Johnson celebrated and preached at our Patronal Service. Our children played important roles in this service showing us our future. All enjoyed a catered lunch after the service. The anniversary events concluded on November 22 with a Scout parade. Many of the Beavers, Cubs, Scouts and Venturers who meet at St. Martin’s joined us for the 11:00 am service and assisted with the liturgy. Learn about the past, present and future of St. Martin-in-the-Fields through the eyes of parishioners and clergy in this video from our 125th Gala Dinner.